The Toyota WA Head Office by Roxby Architects has taken out the greatest honour at the Australian Institute of Architects’ WA Architecture Awards in 2014. The George Temple Poole is presented to the project judged most worthy of all the award winners. In choosing the Toyota Head Office in Kewdale, the jury called it a sophisticated design response to the purpose specific client brief. “The architects have responded in an elegant manner to the brief that provides a landmark site within one of WA’s largest industrial areas,” the jury commented. Toyota's philosophy of kaizen, or continuous improvement, was translated into built form through vertical external blades fitted at shifting angles to enhance the sense of motion as one passes the building. 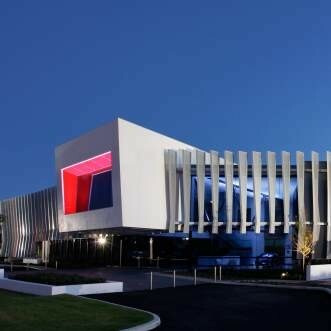 The Toyota WA Head Office also took out the Ross Chisholm and Gil Nicol Award For Commercial Architecture in the Commercial Architecture Category. Fremantle kitchen and bakery Bread in Common also featured prominently, taking out the Margaret Pitt Morison Award For Heritage, the Architecture Award in the Commercial Architecture category, the Julius Elischer Award for Interior Architecture and the Mondoluce Lighting Award. All Western Australian Named and Architecture Award winners will progress to the Insitute’s National Awards to be held in November. Institute State President Philip Griffiths said the Architecture Awards represent a rare opportunity each year for a large number of Western Australian architects to show their design capabilities to their colleagues, industry and, most importantly to the public. “Judgement by one’s peers is a high bar and the fact that people are prepared to nominate their projects in competition with their colleagues indicates that there is a great deal of respect for the awards in the profession,” he said.